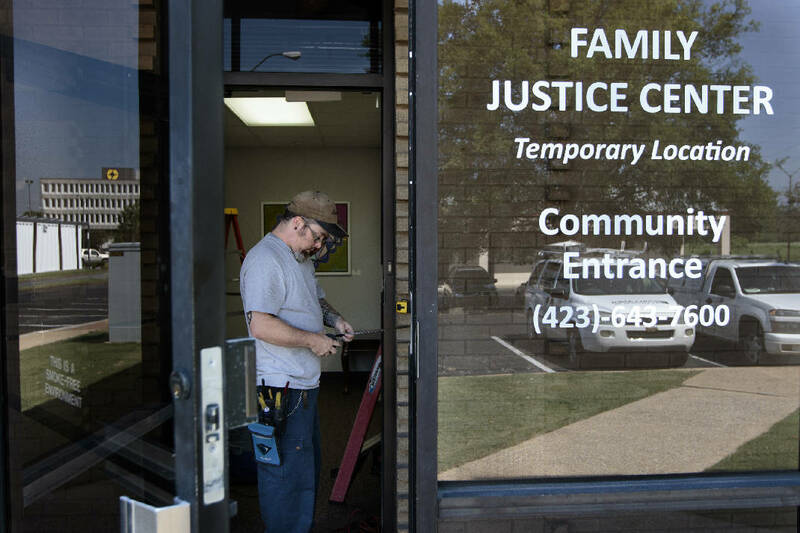 Marc Benton with Gallaher & Associates works to install a security system June 17 at the Family Justice Center in Chattanooga. Fifty-five women were killed by men in Tennessee during 2013, ranking the state sixth in the nation for the per capita rate of women slain by men, according to an analysis by the Violence Policy Center. Most are killed by a man they knew, according to the study, which analyzed national homicide information compiled by the FBI. It focused on slayings in which one man killed one woman during that year. Nationwide, 1,438 women were killed by a man they knew in 2013, compared to 92 who were killed by strangers. Researchers found that guns were the most commonly used weapon — 53 percent of women were killed with a gun, 20 percent were killed with knives and 13 percent were killed with blunt bodily force. Those national trends are even more pronounced in Tennessee, where 63 percent of women were killed with a gun and 98 percent were killed by a man they knew in 2013. Only one woman in Tennessee was killed by a stranger. In Chattanooga, one woman was killed in 2013, two were slain in 2014 and, so far this year, four women have died at the hands of a man, according to records kept by the Times Free Press. "When women are killed by men, they are killed by someone they know, rather than a stranger, and if they know the person, he most likely was an intimate partner," said Kristen Rand, legislative director for the Violence Policy Center, a nonprofit organization that works to stop gun death and injury. In most situations where women are killed by intimate partners, there is a pattern of abuse in the home, said Lt. Darrel Whitfield, the special victims unit supervisor at the Chattanooga Police Department. "There is usually a history of some type of domestic violence," he said. "It doesn't usually start with 'everything is OK' and the next day he kills her." Because of that, it's important for women who are facing abuse — either verbal or physical — to seek help early on, Whitfield said. Many women hesitate to report abuse because of financial fears or social stigma, he said. Sometimes, the women themselves are involved in illegal activity and don't want to approach police. Whitfield hopes the city's new Family Justice Center can be an easier place for women to report abuse, rather than going straight to police. The center is designed to cater to victims of domestic violence by offering a variety of services — from legal advice to health care — under one roof near the Eastgate Town Center. Staff at the center can help women obtain orders of protection, find a new place to live or get financial help, said Jani Clark, an employee at the center. But even women who do come into the center often still struggle to cut ties with their abuser, she said. "It's very common they go back," she said. "It takes around seven times of coming to talk to us [for them] to decide that it is time to move on. Often there's an attachment to the person; he may be the father of your children, you've been with him for 30 years. It's a numb feeling, and you're used to it." Friends and family can help to encourage a woman or man to leave an abusive situation, but that encouragement should be offered carefully, Whitfield added. "You can't just go in and say, 'I heard your husband beat you up' while he's in the same room," he said. "That just makes the problem worse. If you want to help a friend out, it needs to be done with care, in the right time and place." The Violence Policy Center, which compiled most of the data for the study, was founded by executive director Josh Sugarmann, a native of Newtown, Conn., 24 years before the Sandy Hook Elementary School mass shooting there. The center's mission is to inform the public about the impact of gun violence on their daily lives, expose the profit-driven marketing and lobbying activities of the firearms industry and gun lobby, offer unique technical expertise to policymakers, organizations and advocates, and work for policy changes that save lives, according to its website.